Thinsulate insulated Kup Kollars for hot and cold take-out cups. Perry and I ate at One Caffe Coffee before he taught his seminar. His latte coffee was “solid, better than Starbucks”. I enjoyed Twoleaves & a Bud peach flavor tea. Our food was fresh and tasty. That’s kool. Having no destination, I began walking. I found familiar pink flowers on Edgewood near a freshman GA Tech dormitory. I call these my birthday flowers. Growing up, my family had a large bush in our backyard that was in full bloom every June. My Mom always took my birthday photo in front of this bush. Moving on, I came upon a statue in John Calhoun Park. Done in 1993, it’s called “Ancestral Totem” by artist Ayokunle Odeleye. It was refreshing walking among the shade of the trees on this hot Atlanta day. Farther on I found Hurt Park that was part of the 2007-2008 Urban Intervention: The Beltline. The exhibit by artist Pandra Williams was called “Return of the Native Garden” planted with drought-resistant plants. I found it interesting that the street side walk was originally built around trees bordering the park. 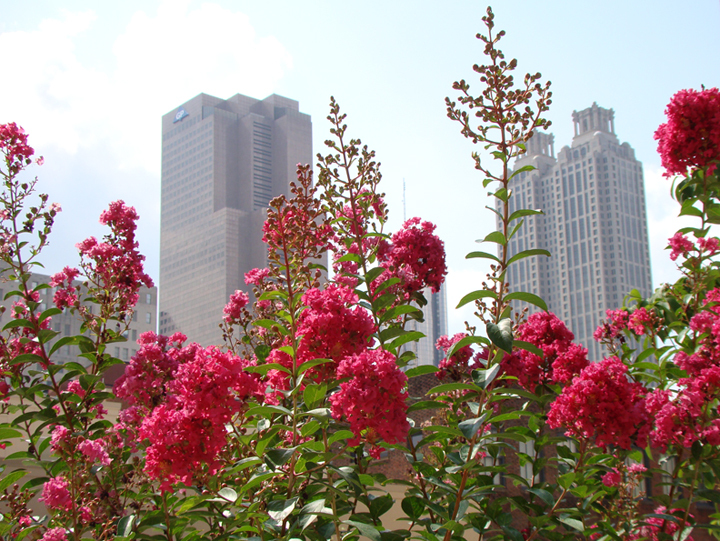 Exploring Atlanta, GA in the summertime was very interesting. That is hot – very hot!